The mail aim of this project was to make provision for implementing a management plan to conserve, protect and promote the Hazel Woods, its biodiversity and flora. 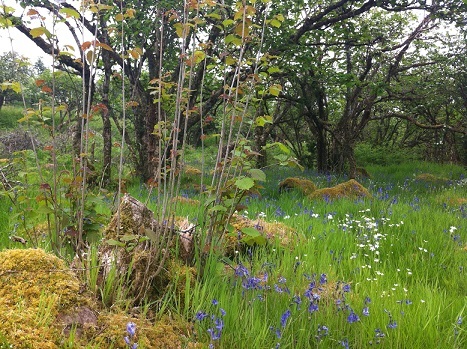 Applecross Hazel Woods is an Area of Semi-Ancient Woodland. However management of the woodland has long since ceased and deer use the area for shelter from the wild winter weather. This has meant that growth of the ancient hazel trees had all but stopped and the wood was in danger of dying out. It was agreed that a small section of the woodland be sectioned off and monitored for growth under various different environments. A management plan was produced by Samuel Bridgewater, which set out recommendations on how to manage, conserve and protect the trees, habitats and lichens. The newly fenced area of the woodland was then coppiced and managed over the course of a year. New growth of hazel was recorded, as were wild flowers and wildlife. The work undertaken within the fenced area of the hazel woods was done by volunteers and guided by hazel expert, Les Bates. The group continues to meet several times a year to monitor growth of plantlife and to coppice the hazel woods.